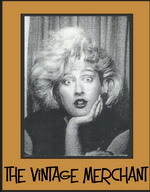 Please help me in welcoming our second Featured Sponsor for August The Vintage Merchant. If you are looking for a place to shop for 1930's clothing all the way to the 80's then you have met your match. The owners at The Vintage Merchant are fond of the Rockabilly/Psychobilly and Hawaiian tiki. 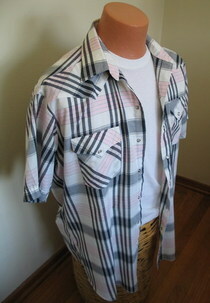 They also specialize in vintage dresses and mens clothing. 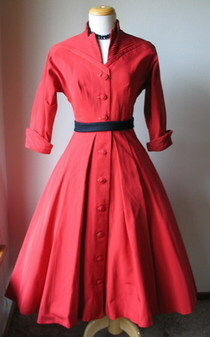 These two happen to be two of my favorite dress picks from The Vintage Merchant. Left is a late 1940's/early 1950's red faille shirt waist dress is labeled "Another Lucky Star Fashion New York." 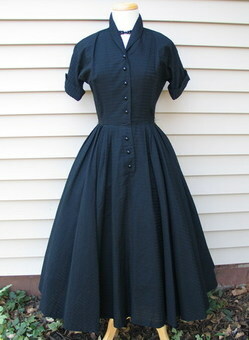 Right is a Dior Style Late 40's/Early 50's Black New Look Cocktail Dress. These won't last long I'm sure, I just love the 40's and 50's styles. I think you'll be pleased with the men's fashion offered at The Vintage Merchant as well. Swanky blazers and jackets as well as sophisticated bow ties make their line of mens wear stand out from the rest. 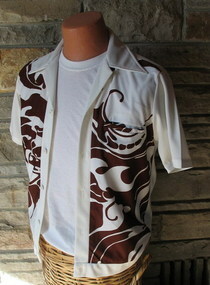 I love the look of Mod 70's Vintage Tiki Aloha Hawaiian Jac shirt on the left and the Black,White and Pink Rockabilly Western Cowboy shirt on the right. Head over to The Vintage Merchant today to check out all the categories mentioned here as well as accessories, outerwear, kids clothing and more!